The 106th Legislature, First Session of the Unicameral is in session. There were 739 bills introduced. The Nebraska Association of Commercial Property Owners (NACPO) has identified 60 bills that affect commercial and investment real estate. NACPO is actively monitoring, supporting or opposing these bills. As in the 105th Legislature, there are a number of bills regarding taxes and development/tax credits. There are also bills concerning State building codes. We wanted to bring to your attention two specific issues that impact real estate. There were two bills introduced (LB86 and LB393) to increase documentary stamp fees on real estate sales by $1.00 to $3.25 per $1,000. One of the bills applies this to all sales, while the other only applies the increase to sale prices of $1 million or more. NACPO is opposing any increase. The second issue has been highly publicized, especially in Omaha. The bill is LB85, introduced by Senator Justin Wayne of Omaha, requiring registration of landlords of residential rental units and periodically requiring inspections. NACPO and the Apartment Association of Nebraska oppose this bill and back the City of Omaha’s position on it. For questions and comments about legislative issues, please contact John Dickerson at 402.778.7521. 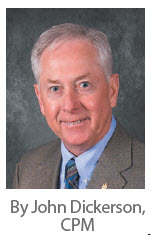 John is the current President of the Nebraska Association of Commercial Property Owners.